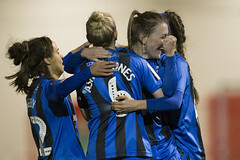 Gillingham Ladies booked a place in the semi final of the Kent FA women’s cup after a resounding win over Margate Ladies at Hartsdown Park. Goals from Breon Grant in the first half gave Gills the advantage at the interval. 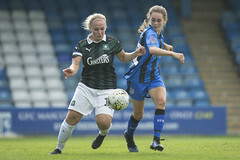 A brace from Alice Bussey in the second half along with strikes from Ellie Manning and Vicky Ashton-Jones secured a last four tie for Gills. 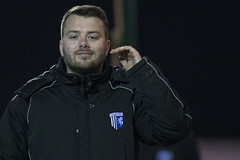 At a cold and blustery Hartsdown Park, Gills were keen to avoid a start like that against Margate in pre-season where the hosts took an early two goal lead. In the opening few minutes, Gills were on the attack, Sharna Giordani scuffed a shot which went wide of the goal. Gills followed up with another attack. Gills were awarded a free kick after Alice Bussey was fouled by Nicole Adams. Daisy Monaghan’s delivery into the penalty area was headed wide of the goal. 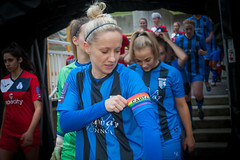 Margate had an effort on goal when Rebecca Longley picked up a lose ball and tried an ambitious long range effort. The looping shot was dealt with by Courtney Shanly. 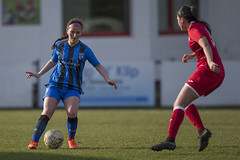 Alice Bussey was at the heart of the Gills attack, it took a double block from Margate defender Rebecca Longley inside the penalty area to deny the young Gills’ forward. Grant looked to add to her tally but was denied by ‘Gate keeper Lauren Watson did well to tip a shot round the post for a corner. After the restart Gills quality showed through, in the 52nd minute Alice Bussey was fouled by the Margate goalkeeper on the edge of the box. The resulting free kick was tipped over the crossbar by Watson. Gills Ladies will face either of Herne Bay Ladies, Ashford United Ladies or Gillingham Ladies DS in the semi final of the competition. Margate Subs: Katie Longley, Shannon King, Isabelle Robinson, Annabelle Ashby, Megan Longden.